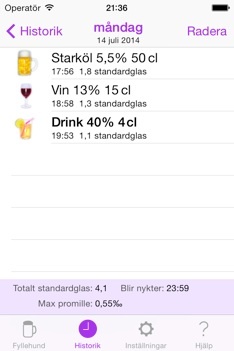 With Alco Dog you keep track of what you drink at a night out and stay fresh the day after. 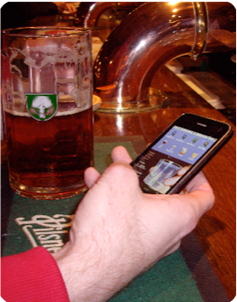 It can be hard to use a drink tracker app in a dark and noisy pub, but with Alco Dog it is really easy, just tap two times to enter a drink. Watch the Alco Dog movie. When you exceed a certain BAC-level the Alco Dog will bark at you! You decide when to be warned, about how much you drink, in the settings. •First choose the beverage, e.g. beer, wine or a drink. • Then choose serving size. You're done and the party can go on. 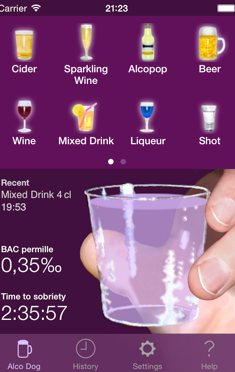 Alco Dog shows an estimate of your Blood Alcohol Content (BAC) level and the time till you are sober. In the history you can see your previous drinks during the current day or evening, as well as previous drinking sessions. 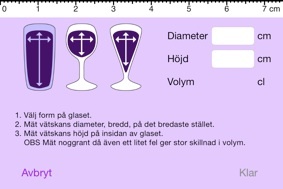 If you don’t know the size of the glass, bottle or can, you can use the glass calculator. Just measure the width and heigth of the glass, and Alco Dog computes it’s volume. Alco Dog will adopt itself when you go abroad. Just tell Alco Dog where you are going and Alco Dog will help you with typical serving sizes and drink names in that language, in addition to your own. Currently 20 countries or regions are supported. NOTE! Do not use Alco Dog to determine whether you can drive or do other tasks that require sobriety. This is because the breakdown of alcohol is individual and affected by genetic factors and how used to alcohol you are. Even after the app accounts for bodyweight and gender, the alcohol decomposition rate may vary ±20% between individuals, or more in rare cases. 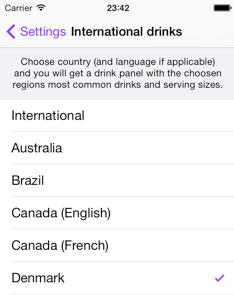 Alco Dog supports serving sizes, drink names and local drinks in the United States, Canada (english, french), Australia, UK, Ireland, Germany, the Netherlands, France, Italy, Spain, Portugal, Greece, Sweden, Denmark, Norway and Finland (finnish, swedish) and Brazil. Measurement units and way of displaying blood alcohol content (BAC) are supported for most countries of the world (per cent, per mille, mg/100ml, g/l). All these can be changed in the settings. Forgot to enter a drink? Drag the hands to set the time when you started drink the drink. 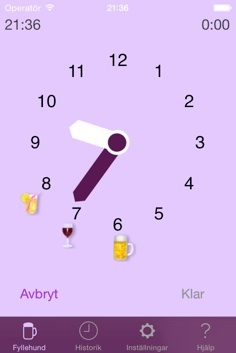 Previously drunk drinks are shown as icons around the hourplate. •Your consumption during the evening, counted as number of standard drinks/units of alcohol. Since standard drinks are not standardized throughout the world, Alco Dog adopts to the standard in your country 1. •Maximum blood alcohol content (BAC) during the evening. 1.Not all countries standard drink definition are supported, in these countries a standard drink consisting of 12 g pure alcohol is used instead, which corresponds to 4 cl of 40% spirit.